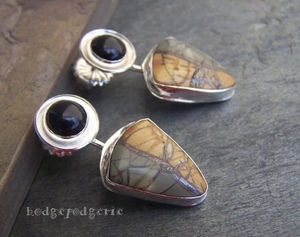 Matching Cherry Creek jasper cabochons have been paired with black onyx in these modern, minimalist earrings in fine and Sterling silvers. 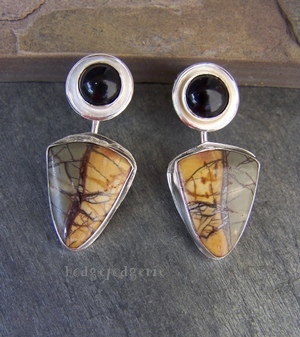 The black striations which create an abrupt division of grey and ochre in each of the larger stones reminds one of a small southwestern river with its many tributaries. Friction-style posts with extra large 10mm Sterling silver wingnuts hold them securely. Earrings measure approximately 1-5/16 inches long x 5/8 inches wide. 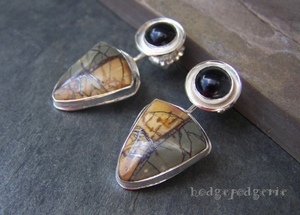 Return from "Poco Rio Earrings" page to "Earring Gallery" page.